Ten years after the passage of the Personal Health Information Protection Act (PHIPA), unauthorized access to personal health information remains a serious issue. This has been highlighted in recent years by a few high-profile privacy breaches. Often, the persons accused of the privacy violations are frontline health care workers such as nurses, clerks or technicians. 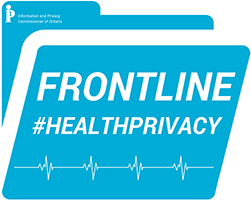 In response, we’ve developed a program called Frontline #HealthPrivacy. Our goal is to establish an online community for frontline health care workers and students by providing platforms for dialogue on this issue. Looking at personal health information for unauthorized purposes is simply unacceptable. It can have devastating outcomes not only for patients, but for health care professionals too. Snooping can result in damage to professional reputations, termination by employers, disciplinary action by regulatory colleges and professional associations, fines and even prosecution. However, the IPC’s primary mission is not to hunt down and punish. We aim to prevent privacy breaches by proactively reaching out to the health sector with programs and initiatives like Frontline #HealthPrivacy. Unlike short-term awareness programs, Frontline #HealthPrivacy will offer a steady and evergreen flow of information and resources, adapting to the changing landscape of health care and adopting digital technologies to stay in touch with its audiences. In the coming months we’ll use our social channels to share blog posts, podcasts and webcasts created with health care workers in mind. The IPC aims to provide health care professionals and students with the information necessary to understand their duties and obligations under Ontario’s health privacy legislation. We believe we can reduce the number of health privacy breaches by creating an online community to exchange of ideas, information and experiences. We hope you’ll join the conversation.